Happy New Year! Good wishes to you all that 2013 sprinkles us with abundant joy. Unless we get a few serious sprinkles from above, we need to water our wildflower rosettes, like bluebonnets. Thanks to Jean Warner for Daphne’s question this week! 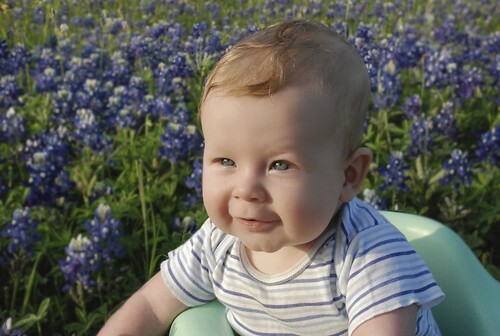 Like Jean, my bluebonnets are up, along with larkspur and weeds—so be careful out there when pulling. If you make a mistake like I have “now and then,” quickly plug the keeper back in and water. Here are baby poppies, not native, but still so pretty and beloved by bees. So, Jean wants to know if freeze will harm her healthy crop of bluebonnets. As Daphne reports, cold weather isn’t a concern for our native wildflowers that emerge in fall to hunker down as rosettes until the magic moment. But lack of water certainly is. Annuals, like bluebonnets and many others, will wither away and never flower and seed for next year without moisture. And we certainly don’t want to miss pictures like this Flickr sequence, thanks to KLRU’s Sara Robertson and her baby’s first Texas 2012 spring! Lack of water is the reason we’re losing valuable trees, too. Tom joins consulting arborist Don Gardner to explain why it happens and what we can do. Find out how far out to water your trees for their age and size. KLRU graphic designer Mark Pedini crafted this to illustrate one of Don’s important points. In drought, the absorbing roots get smaller and smaller until eventually the tree only has woody, anchoring roots. Those fine feeder roots are what we must water to keep the tree alive. Check out Daphne’s explanation of woody roots and whether we can plant over them. Meet Don in person for more tree care tips on January 26 at 2 p.m. at the Lady Bird Johnson Wildflower Center’s Tree Talk Winter Walk. This free event is from 9 a.m. -5 p.m.
Watch this great video from the Texas A&M Forest Service for more on watering your trees. Not only do we need to water our fruit trees, now is the time to apply horticultural oil to fend off hibernating insects and their eggs. John Dromgoole explains how to help prevent pests like plum curculio and bacterial and fungal disease with proactive care. Oh, the first thing is to sanitize the garden—all year long—by removing old leaves and fruit from the ground. If you don’t have space for fruit trees, I just bet you have a spot to grow pretty edibles, like this ‘Joi Choi’ bok choy! Daphne’s Pick of the Week is something you can pick and eat: winter edibles! And no need to restrict them to an official vegetable bed. Tuck them in among your perennials, like these at the Travis County Texas AgriLife Extension demonstration beds in October. Whether you eat it or not, nutritious Swiss chard is a beauty among winter annuals. Many of mine didn’t weather summer’s heat, but this one never faltered. You can still plant winter edibles among your dormant perennials for a pop of delicious color. In fact, check out the Master Gardener’s free workshop January 17 on how to plant and save seeds. Daphne also suggests letting some plants bolt or go to seed for their structural addition and flowers. With fall’s warm weather, many of our crops bolted early this year, so go ahead and replant, like lettuce. Molly O’Halloran shares this lettuce soup recipe (which she thickened with diced potatoes) to use lettuce that’s past its salad prime. Here’s another reason to “try it at home.” Look at the size of this carrot grown by Nancy and Richard Simpson in their year-round organic vegetable garden! I bet you all, like me, have the fix-it-up bug. 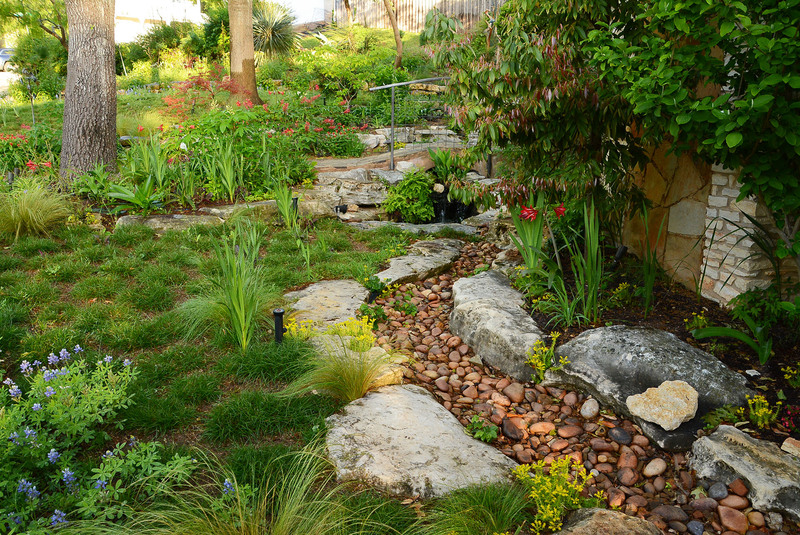 Here’s some great inspiration and tips from designer Annie Gillespie of Botanical Concerns at her hillside garden.